Dr. Gray is proud to share that she hasn’t been sick since January 1, 2006. What’s the secret to more than a decade of health? With flu season nearly here, we want to share it with you. It’s going to sound simple, but these steps are ones that we rarely give ourselves time for. When looked at in simple terms, your ability to stay healthy depends solely on the strength of your immune system. With strong immunity, you can fight off any germs you’re exposed to, even if they cause others to hibernate in bed for a week. 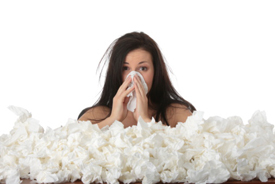 So, how do you keep your immune system robust? For Dr. Gray, her upswing in health began when she started with chiropractic care. She doesn’t wait until she’s sick, by being proactive year round with her spinal alignment she feels this is why she is so healthy. An aligned spine structure optimizes neurological function which optimizes the function of the immune system. Also, Dr. Gray pays close attention to her body. If she starts to feel run down or senses the beginning of a sniffle, she takes supplements, drinks plenty of water and remembers to get ample rest. The next day, any trace of illness has been banished by her healthy habits. Though these recommendations aren’t tough to follow, you might feel you’re too busy and can’t set aside time to take care of yourself. You are worth the time, and so is your well-being. We caution our patients about the many considerations involved when getting a flu shot instead of taking care of themselves. There is a time, and there is a place for all types of medicine. We firmly believe in non-chiropractic solutions for certain health conditions; however, it’s important to remember that there are two sides to every story, and you deserve to be informed on both before deciding what’s right for you. In the case of the flu shot, the Center for Disease Control’s statistics about the vaccine’s ability to prevent even a single death isn’t promising. Though you may think it’s worth the risk, there are complications and potential hazards that come along with every injection. Toxic materials in vaccines can cause tremendous health issues, and there hasn’t yet been research conducted that shows the long-term effects of these materials. So, where does that leave you? At Restore Chiropractic, we encourage our patients to seek the knowledge they need to make the best decision for themselves and their families. Read labels. Look up the research. Talk to reliable experts in different fields. Most of all, remember that our team is here to guide and support you on your lifelong journey to health. If you have any questions or concerns, we’ll be happy to discuss them with you, providing our advice along the way. Call us today!